Young Ann Hasseltine was a woman consumed by the world. She attended all the highest fashion parties and quickly became a woman of class in 18th century America. Though her father was the co-founder of Bradford College, Ann cared much more for improving her appearance than her mind. The change in her life was obvious to all. She sought practical holiness and studied diligently because she felt it was her obligation to improve her mind for the glory of God. A few years later she met Adoniram Judson, a man called to be a foreign missionary. He later wrote to Ann’s father for his permission to court Ann. But his request was different than what was typical for the day. “I have to ask whether you can consent to part with your daughter early next spring to see her no more in this world. To expose her to every kind of distress, to degradation, insult, persecution, and perhaps a violent death,” he wrote. Ann’s father agreed and the two married the next year. Two weeks after their wedding, Adoniram and Ann Judson set sail for India. Due to political problems they were refused entry. Rather than returning home, they landed in Burma and began sowing the seeds of the gospel. Life in Burma was difficult for both Adoniram and Ann. Adoniram would spend weeks away from their home on preaching tours. This left Ann at home without another Christian companion. Their firstborn child died at seven months old. Some years into their ministry, the British Burmese War began. Adoniram was accused of being a British spy. He was moved from camp to camp, eventually landing in what was called Death Prison. Ann, with their newborn daughter in tow, would plead with prison guards and government officials for her husband’s life. Food was scarce for Ann. But she took what she could find and gave it to Adoniram. She moved into the corner of a jailor’s house and lived there for two years. When the war ended and Adoniram was released, he finally laid eyes on the wife that kept him alive. Her head was shaved, she was shrunken to the last stages of emaciation. Adoniram moved her to governor’s house where she began to recover. The Judsons moved to the areas of Burma controlled by the English because they would have the freedom to evangelize. Three days after their relocation, Adoniram was called away to help the British government in their negotiations with the Burmese. The trip lasted longer than either expected and, five months after he left, Adoniram received a letter that said, “Mrs. Judson is no more.” She died a month earlier. To hear the story of Ann Judson in greater detail, and to see how we can rest in the God who all-powerful and all-knowing, revisit weeks five and six of Behold Your God: The Weight of Majesty. God never promised His children a life of ease and comfort. Ann Judson’s life is proof of that. But she held to the promise God makes all His children: that He will be with them, especially in difficult times. That presence was the treasure Ann pursued. It never disappointed or left her wanting. 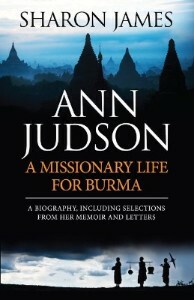 You can read her story in Ann Judson: A Missionary Life for Burma from our good friends at Reformation Heritage Books.